It's just two more days to go for the most awaited 'Mersal' Release! It came as a surprise to everone when Vijay met Tamil Nadu Chief Minister Edappadi Palaniswami at his official residence in Chennai. The meeting assumes significance as Mersal has been facing problems in the run-up to its release. One of the important issues faced by Mersal makers is that the Censor board is yet to certify the film even as there are only two days left for the release. However, reports claim that the actor has met the leader to thank for reducing the state entertainment tax from 10 per cent to 8 per cent. 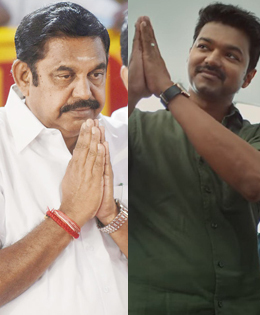 The double taxation that exists in Tamil Nadu has hit the industry badly, and strikes of multiplxes and single screen theatres have hit the film business heavily. The state government has finally raised to the occasion and has brought down the state taxation of films in the state by two per cent. There are no new Tamil releases since October 6 till today. This film is expected to be one of the high-profile Tamil releases in 2017. Ever since the project commenced, fans throughout the country are eagerly waiting for the film’s first day first show. The first look posters and even the teaser have already received an amazing response from the audience. Directed by Atlee, the star cast includes Nithya Menen, Samantha Akkineni, Kajal Aggarwal, SJ Suryah and Vadivelu in various important roles. Vijay will be seen in three different roles, namely a panchayat head, a magician and a doctor. Mersal is produced by Sri Thenandal Films and its music has been composed by AR Rahman.